Lent was serious business back in my Catholic elementary school days. Meat disappeared from the Friday lunch menu. Our colorful classrooms were stripped of decorations in favor of simple, spiritually-themed bulletin boards. In the parish church, we assembled for Stations of the Cross each week, surrounded by shrouded statues. For the older kids, Lent even meant giving up our morning snack. We and our stomachs grumbled as we grumpily drank our plain milk and wondered what was for lunch. We wanted to run and play in the afternoons, not kneel uncomfortably in the stuffy church and pray. We wanted our Friday pizza lunches and our mid-morning snacks and our colorful classroom displays. We wanted to yell “Alelluia!” and not get the stink-eye from the closest teacher. We could not relate to the somber hymns or carved wooden stations depicting the sufferings of Christ. We were children, and we wanted life to be fun—not filled with gloom, hunger, discomfort and plain, unadorned prayer. 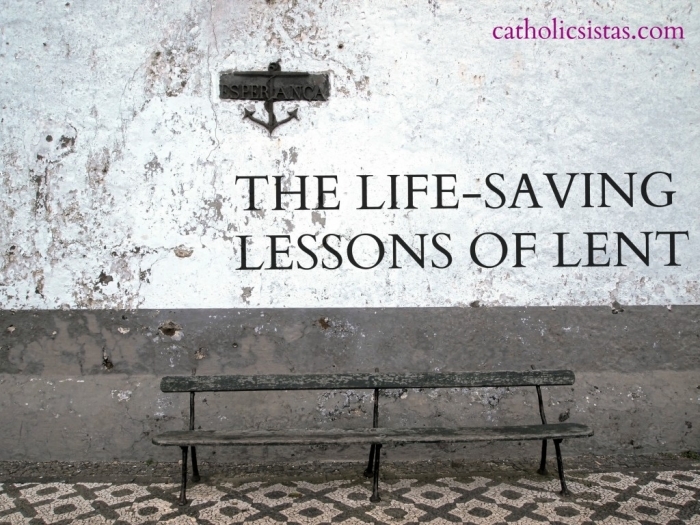 Fast-forward eighteen years, and I could not be more grateful for the Lenten lessons I received in my youth. As adults, we soon learn that life is not always joyful. Far from endless play and fun, we face events like death, illness, financial strife, and interpersonal struggles. For those of us with a mood disorder, joy can even be elusive. As we fight negative thoughts, experience yet another dry day in prayer, or deal with the physical pains of our conditions, life can seem like a never-ending Lent, a perpetual trial in the desert. Move on to the “Next Big Thing” to enjoy or consume. Move the carnival to the next town and try again. If that doesn’t work, we can’t help you. Keep your negativity to yourself. Don’t bring the rest of us down. We’re having fun. With this outlook so prevalent, it is no wonder that 15.7 million U.S. adults experienced a major episode of depression last year. It is no surprise that every twelve minutes, a suicide occurs. The Christian life, as lived out during the season of Lent, provides the most meaningful alternative to a world with no plan for suffering. When we fall, we can look to the trials of Christ carved into the Stations of the Cross. When we hunger, we can listen to the Scriptures and know that the Son of God himself was famished. When we weep, we can reflect on the sorrows of His Holy Mother. When we cry out in prayers of pain or terror, believing with our wills what we cannot feel in our hearts, we can fix our eyes on the Crucifix and hear His voice calling with us, “My God, My God, why have you forsaken me?” But most importantly, because we are Christians, in the deadened darkness of grief or mental illness, we do not have to listen to the world when it tells us to move on or give up. We can hope in the Resurrection and the triumph of good over despair itself. We can trust that someday, just around the corner, early in the morning on the first day of the week, the Tomb will be empty. These important lessons must be passed on to the next generation with purpose, or they will be drowned out in the carnival music of the dominant culture. I am perpetually indebted to the teachers at St. Mary School for allowing me the joys of childhood while preparing me for the unknown hardships of adult life. Without them, and their dedication to instructing me in my faith, I might have listened to the world and given up my struggle with depression.